Japanese Episode DP 011: "Hikari! Contest Debut!!" American Episode 475: "Mounting A Coordinator Assault!" 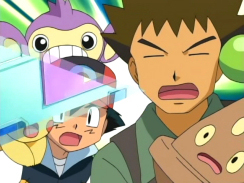 The time for Hikari's first Pokemon Contest has arrived! As the young Coordinator tries on a dress sent to her by her mom, she meets another Coordinator named Nozomi. After the two become friends, Hikari and Satoshi have a practice battle outside. Hikari shows her traveling companions that her Potchama is able to store energy in its beak during a Peck attack, a demonstration that really shows how focused Hikari is. As the battle continues, Satoshi's Aipom joins in, and before long its desire to enter the Pokemon Contests becomes clear. 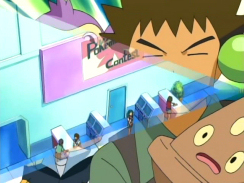 Hikari and Takeshi urge Satoshi to enter, so Satoshi reluctantly registers for the Contest alongside Hikari. Also entering is Musashi, disguised as Candy Musalina, along with Kojirou's Muscippa. After a sleepless night, Hikari arrives at the Contest Hall. There, she watches Nozomi's Appeal round with awe as the young Coordinator commands her Muma in a fascinating show of shadow and light. 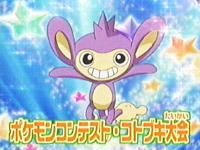 Satoshi and his Aipom impress the judges with its speed, and Candy Musalina's bond with her Muscippa surprises everyone. Hikari's turn finally comes, so she and her Potchama unleash a flurry of bubbles that are then pecked away with a series of rapid strikes. Now that the Appeals round is over, Hikari, Satoshi, Nozomi, and Candy Musalina anxiously await the announcement of who will move on to the second round. To be continued! It's Super Contest time! Which is basically the same as Regular Contest time except everyone (but Satoshi) dresses up and there are more sparklies. While the lack of any real distinction between Ruby/Sapphire/Emerald Contests and Diamond/Pearl is a shame, the DP Contest arc is already shaping up to be another great storyline. Nozomi is a nice enough rival, but we won't get to see her true colors until the next episode. Satoshi joining a Contest was a nice twist, and it's great to see Musashi join in on the fun as well. While there is some repetition (how many Appeals featuring bubbles are we going to have to sit through? ), the episode has enough Contest-y drama to keep me entertained. One interesting tidbit that was brought to my attention by PokeAni is that both Hikari and Nozomi are the names of lines on the shinkanesen. Does this mean we're going to see a second rival character named Kodama somewhere along the road? The dubbed version has a few odd rewrites, but overall it's not too bad. While we only hear four pieces of music from the Japanese version, the four pieces they do use are pieces we don't hear all that often. Especially that slow, instrumental of Hikari's Theme...can you imagine any other piece of music for that scene at night? Me neither. Bipper, Gallop, and Buoysel keep their Japanese voices. Dawn: "See!? I've got the choker now so you don't have to worry about a thing!" Johanna: "When you tell me not to worry is when I worry the most." Dawn: "Huh!? Huh? Huh? Huh?" Originally, Ayako yells at Hikari for being rude to Nozomi by not thanking her properly. So, Hikari turns around only to find that she's missing. The scene makes sense in Japanese because Hikari is told to do something and turns around to do it. In the English version, Dawn really doesn't have any reason to turn around. A one-second transition thingee is removed from the shot right before our heroes register for the Contest. This cut is made because of the way the commercial break falls in the dub. First of all...Brock's "Oh Nurse Joy, you're so huggable!" during the night scene is dub-only. Originally, Takeshi doesn't say a thing. Nozomi's "Ready go" (as in "Ready go, Muma!") is changed to "Curtain!" Hikari's "Charm On!" (as in "Potchama, Charm On!") is changed to "Spotlight!" Marion: "Jessielina's reaction to Carnivine's bite is the penultimate in dramatic flair!" Um...Marion? "Penultimate" means "next to last." Not...whatever the hell effect you were going for. Three seconds are added to the TO BE CONTINUED screen. Because that makes everything much more dramatic.